The Siemens HF15M541 is a solid 17 litre solo microwave finished in an exquisite stainless steel exterior. Very well built - looks great Slightly small - check the measurements prior to buying! 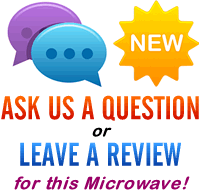 Looking to buy a small and reliable solo microwave? The HF15M541 from Siemens is a very well constructed 17 litre solo microwave, with a sleek and stylish stainless steel finish. It's mains powered and features a maximum of 800w output, with 4 defrost by weight, and 3 cook by weight programs. When in use, it features five different power levels, ranging from 90w to 800w in power. Overall size is fairly small - measuring 46.2cm by 32cm by 29cm externally, and 19.4cm by 29.0cm by 27.4cm internally, with a 24.5cm glass turntable. Weight is a fairly standard 14kg - so not too heavy. The power cord is pretty long at 1.3m, which should be long enough for the majority of users. In terms of both performance and construction, we couldn't fault this offering from Siemens - granted it is pretty small, but this is a minor criticism. Overall our testers were very impressed. 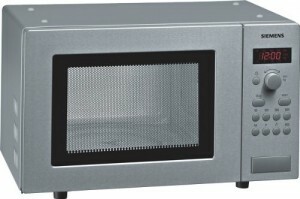 A decent solo microwave, which despite it's modest dimensions performs admirably. If you're looking for a small yet reliable solo microwave, then the Siemens HF15M541 is worth every penny.